News to Us this week finds more on local activity around recent interests in oil and gas development in our watershed in the news lately. Also, a new shop opens in Dexter catering to river and nature enthusiasts and a couple of updates on water pollution issues reminding us to keep diligent on both new and known pollutants. Judge denies injunction against oil well in Scio Township For those keeping tabs on oil well drilling in Scio Township, an injunction filed to delay oil exploration drilling in Scio Township was denied in Washtenaw Circuit Court. The delay was sought to have more time to assess potential environmental damages associated with the drilling. The next step may be to take the issue to Ingham County Courts. Open house in Chelsea draws dozens to learn about proposed natural gas pipeline An open house was held in Chelsea to allow residents to get more information about a proposed pipeline that will run from Ohio to Canada through parts of Washtenaw, Lenawee, Livingston, Oakland, Macomb and St. Clair counties. The Rover Pipeline project is scheduled to begin as early as January 2016. Bailiwick’s Outdoors in Dexter offers apparel for adventure sports and fly fishing gear for enthusiasts It is great to see new businesses open that grow our own local “blue economy”. A new river-based recreation shop has opened in Dexter. If you have paddling, fishing, birding, hiking or equestrian needs, consider stopping by and supporting our friends at Bailiwicks. 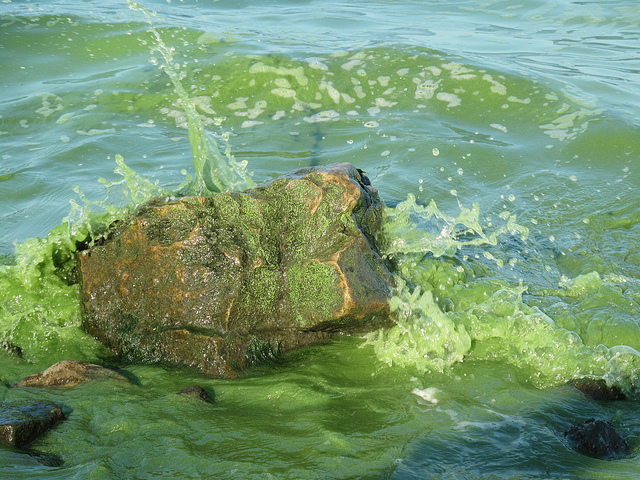 Big Toxic Algal Bloom Again in Forecast for Lake Erie. As a reminder that we cannot assume that once a condition improves it will stay improved – Lake Erie’s algae bloom issues from the 1960’s and ‘70’s have returned in recent years. This year is no exception. Forecasts predict the algae bloom this summer could be one of the largest in the past decade. Phosphorus from fertilizers, sewage and industrial waste is the main culprit driving the blooms. Plastic microbeads could be banned from personal care products in the U.S. by 2018 In a previous News to Us we shared an article about an emerging pollutant to our waterways. Plastic microbeads are used in many cosmetic and personal care products. They make it through many wastewater treatment facilities and into our waters where they are ingested by wildlife and release known toxins. Look for products with natural alternatives such as almonds, sea salts and apricot pits. Legislation has been introduced at the federal level. Illinois is the first state to ban products with plastic microbeads.